Fried Cheese Bomb: Easy Cheesy Appetizers! 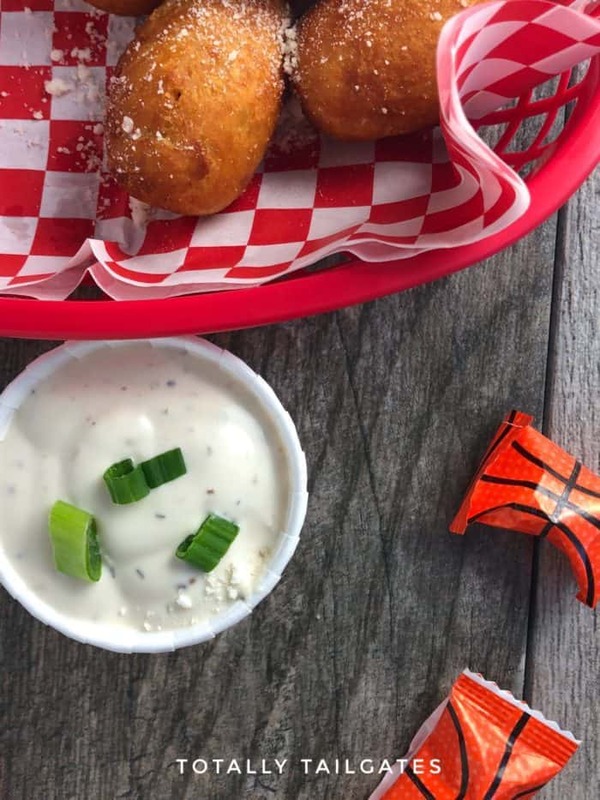 College Basketball March Madness is here…and so is an easy Fried Cheese Bomb recipe! 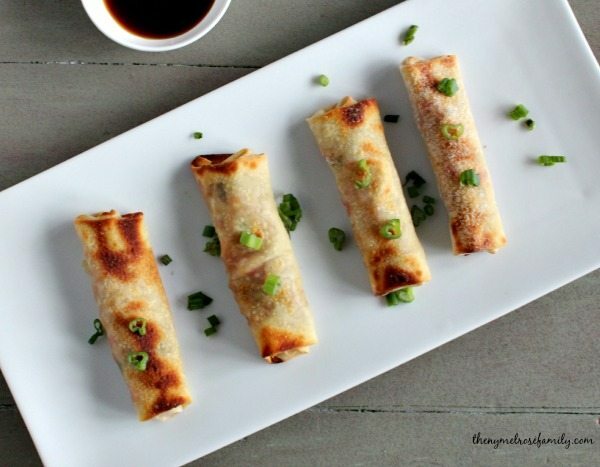 They are an economical way to serve a crowd and they are only 3 ingredients! This is a hearty, cheesy appetizer everyone loves. Hi, I’m Heather from Totally Tailgates, stopping by today with a family-friendly DELISH & CHEESY appetizer! 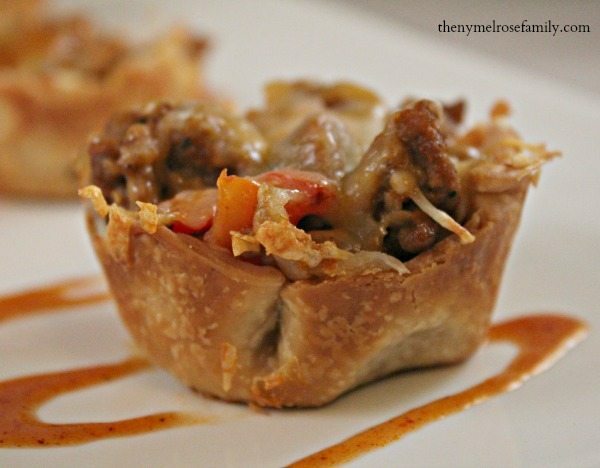 We’ve been eating at home more often and have been missing our favorite restaurant style appetizers, especially now that college basketball March Madness is here! When we are cheering for our Kentucky Wildcats, we like something a little more hearty than chips & dip. (Hey, my 3 Ingredient Chip Dip is out of this world, but it’s not a hot app!) We wanted something hearty. So, I did what every creative mom does…..I scoured the fridge for ingredients so I could do without a special trip to the store. The first thing that caught my eye was that Olde Faithful…..crescent rolls! In my Holy Trinity of Southern Cooking Ingredients, crescent rolls are right there alongside condensed soups and butter. Now, foodies often turn up their noses at the Holy Trinity of Southern Cooking Ingredients, particularly the condensed soups. But let’s face it, these three ingredients anchor most southern dishes in some form or fashion! Give a southern girl just one of these items, and she’ll make a meal! Or a great appetizer. Or a dessert. You get the picture! Armed with my can ‘o crescents, I grabbed string & cheddar cheeses and became BFFs once again with my deep fryer. I used mozzarella string cheese because that is what I had on hand during my refrigerator raid. A Colby Jack blend might be delish, too! 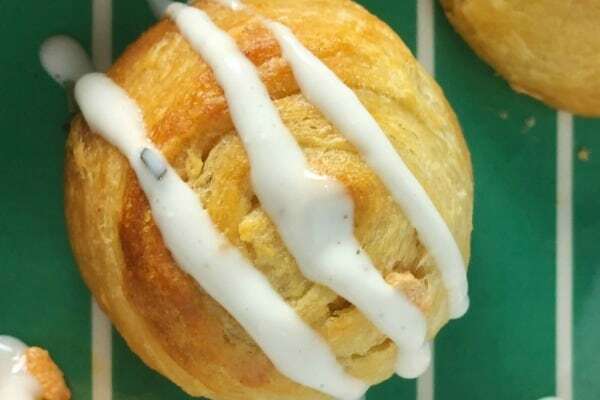 Make sure your crescent rolls are really cold – pulled straight from the fridge prior to using them. Room temperature crescents can become sticky, making the dough a little difficult to manipulate as you are forming your cheese bombs. Tightly seal ALL the cheese inside the dough! No peaking shreds of cheese! We used our electric deep fryer for the Fried Cheese Bomb, but a heavy Dutch oven pot will work, too. Just make sure you use enough oil to cover the cheese balls entirely. 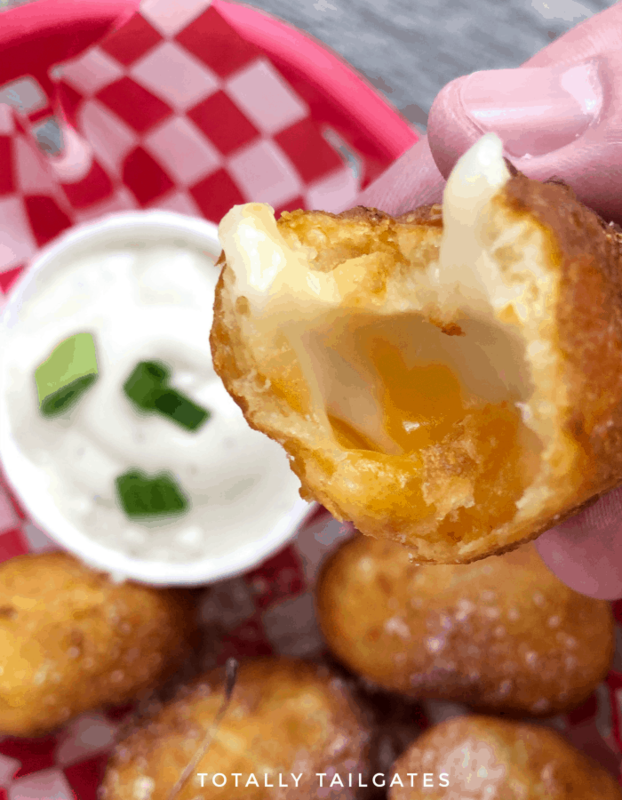 Our favorite dipping sauces for a Fried Cheese Bomb are ranch dressing or marinara sauce. It’s a personal preference – both are great! 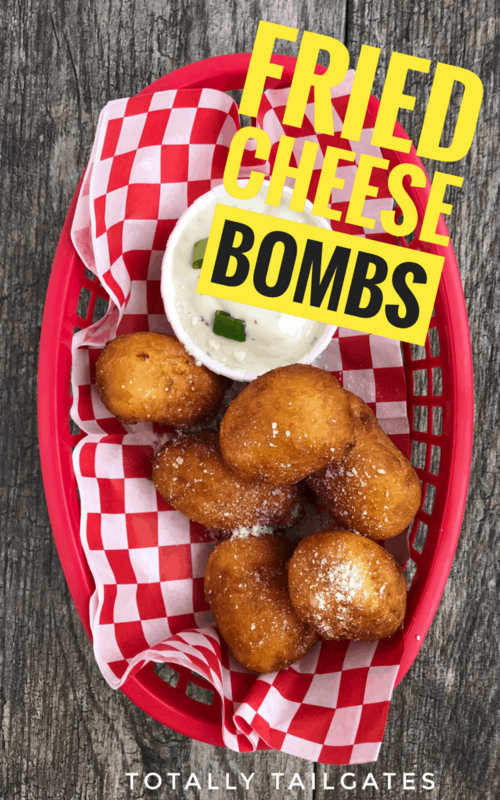 With only four ingredients a fried cheese bomb is the perfect easy cheesy appetizer to make for the game or just to enjoy when company comes over. 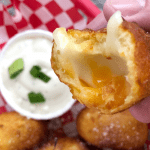 A simple and easy recipe for a fried cheese bomb that only requires four ingredients and is sure to please a crowd. Unroll crescent rolls and form a large rectangle. Press seams together. Cut the dough to make 12 small rectangles. Cut each string cheese piece into 4 sections. Place a pinch or two of shredded cheese onto one of the small rectangles. Put a string cheese piece on top of the shredded cheddar cheese. 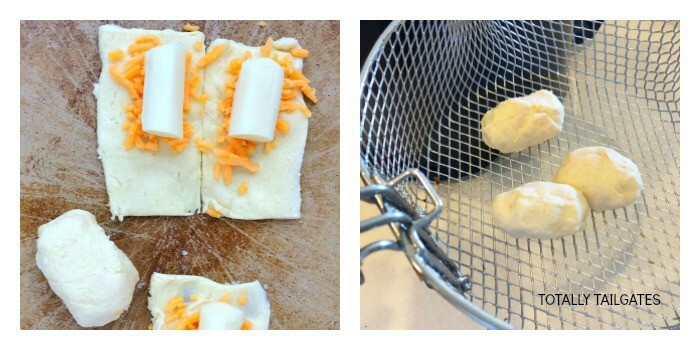 Fold crescent dough over the string cheese and press seams together so the dough forms a sealed ball around the cheese. Repeat this process with remaining cheeses and crescent rectangles. Pour enough vegetable oil into a large Dutch oven or electric fryer so the oil is about 4 inches deep. Heat until it is 350 degrees. Carefully drop cheese bombs into hot oil. These cook quickly, so watch them so they don't overcook. Optional: Dust hot cheese bombs with Parmesan cheese. From left to right: Baked Egg Rolls, Empanadas Mini Pies & Buffalo Chicken Pinwheels. Hi Heather! These look delicious!